Edit: My friends who do follow pro basketball tell me in no uncertain terms: "Forget it. There's no way Toronto can hold up against the Cavs' firepower." Yes, by the looks of that historically lopsided first game, the Raptors are headed for a quick extinction. 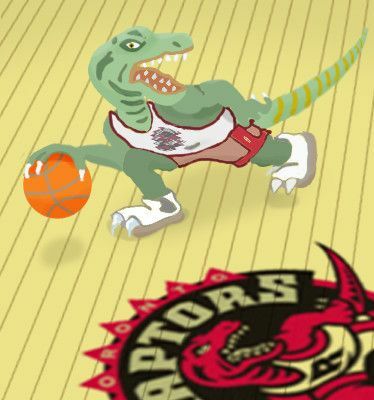 May 23: The Raptors are lasting longer than nearly anyone expected! Looks like quite a slow extinction, if at all -- also see the new cartoon in my art thread (scroll down to the end). May 25: Seeing gruesome defeat in the first few minutes, I had to switch the game off and read Dinotopia -- Windchaser instead. Far more edifying. May 27: Well it's all over for We the North. But fondly remembered. Finally someone gave the King a run for his (virtually infinite) money. The Raptors have finally shaken off their expansion-team punchlines, imbuing the series with a "Karl and Goliath" feeling. A bit like the NY Mets in the 60's. Anyone looking for a more sympathetic take on the Raptors should skip U.S. media and head for The Toronto Star. Like shortwave radio, Internet (usually) respects no borders. Epilogue: Well there's always next year. Well now it is next year! The Toronto Raptors started this 2016-17 season like a barn on fire, but tonight they just blew an 11 point lead to lose to the Sacramento Kings. 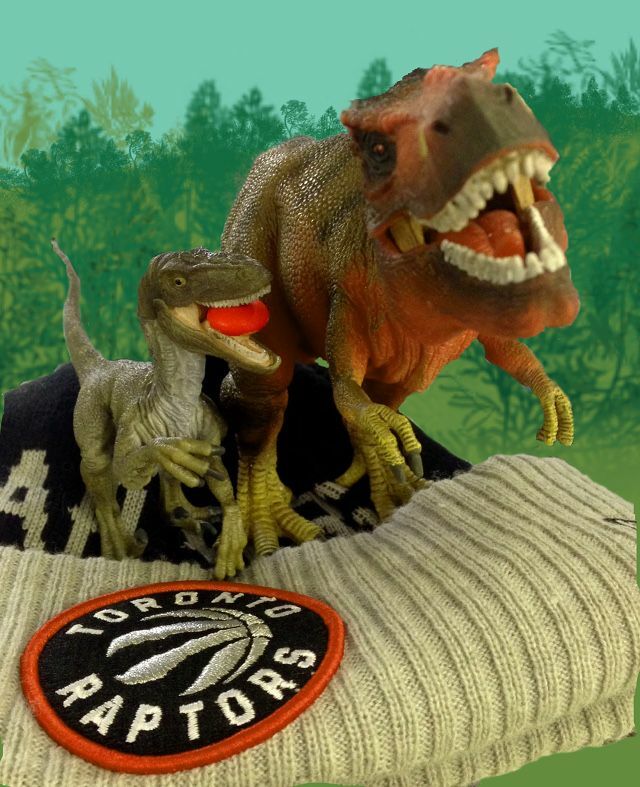 They're still a respectable 4 and 2, with both losses home at the Air Canada Center, a.k.a "Jurassic Park!" DeMar DeRozan has been incredibly hot this season, scoring 30+ points each of the past five games -- but tonight it was not to be. 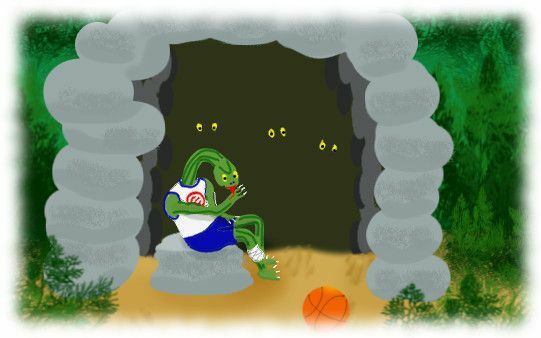 It looks like the Raptors need to sharpen their toe claws! 11/9/16 -- The Raptors found their claws! At halftime it's Toronto by 7 over the Okie Thunder in a thrilling, nail-biting see-saw battle of a game. It started out like a trip to the dentist, but now I'm basking in Raptor glory! Final: 112 -- 102 Raptors! Now 5 & 2 for the season. 11/11/16 -- I considered the previous game a nail-biter.... I'm all out of adjectives for this one!!! Raptors win by two points after being down by 10. They're now playing .750 ball, with DeRozan the top scorer of all the NBA. 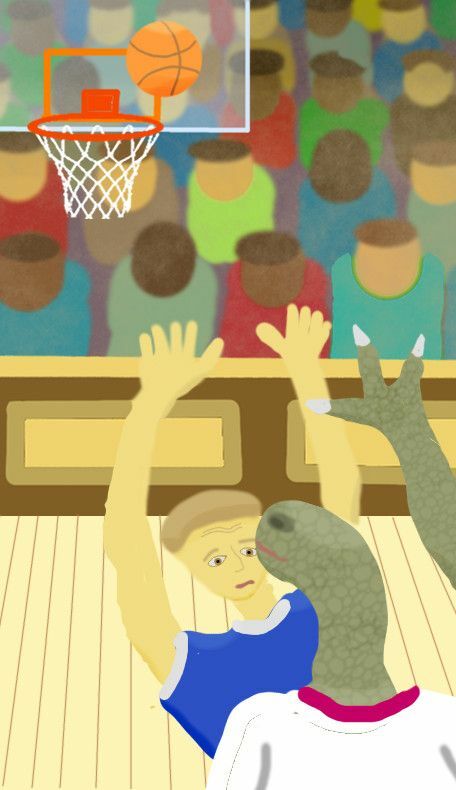 Tomorrow they play the New York Knicks home at "Jurassic Park." I'd better keep my heart medicine handy. Edit: The lead changed hands no fewer than 27 times when the Raptors beat the Knicks! Oh misery!!! Raps drop two in a row. It didn't help that they just played the very best teams in the league -- back-to-back with not even a day's rest. Whoever came up with such a schedule? They're home licking their wounds, finally getting some rest before Friday night's game. And I'm in a depression. 12/5/16 -- After winning six straight, tonight the Raps lost to their arch nemesis -- LeBron "the King" James and the Cleveland Cavaliers. No amount of valor could stand up to this onslaught. I drew up the picture below in hope of victory, yet it was not to be. 12/18/2016 -- Tonight we got the victory as the Raps blew out Orlando, 109 - 79. The Raps play tonight, the fifth game of a grueling road trip which they have presently split, 2-2. After Thursday's awful loss to the Suns, I'm sure hoping they win this one against the Lakers. All season we've seen first-rate shooting with so-so defense -- where they could score 120 points yet still lose the game. Coach Casey's team has made progress, yet road fatigue has hurt in these past two games. The good news is that despite the losses, the Raptors are playing a better grade of basketball than at season's beginning. We could speak of rebounds, assists, and that much-needed defense. But I suggest that all this technical improvement stems from one vital shift -- from individual props to team effort. 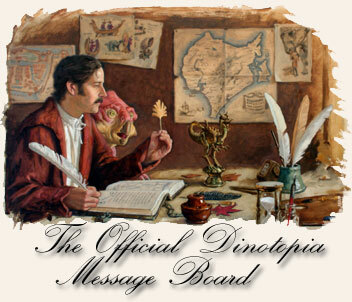 It's Dinotopian cooperation, unlocking beautiful performance! 1/1/2017 -- They won this game, 123-114. This one started off well, went bad for awhile, but oh, what a fourth quarter! Kyle Lowry scored a simply amazing 41 points. 1/5/17 -- Tuesday's loss against the Spurs was dismal, rather like carnage in the Rainy Basin and for me, worse than gruesome torture. But tonight, a late fourth-quarter surge finally pulls out a heart-stopping win for these awesome Raptors! You gotta love this team! 1/8/2017 -- What happened last night? The Raps were busy putting away the Chicago Bulls until somebody hit the kill switch halfway through Quarter Three. They blew a 19-point lead, losing in overtime. This season's Raptors have cemented their position as the best second-place team in the NBA -- could the cement crumble? They're in danger of ceding this spot to the Boston Celtics. Tonight they just blew another lead and let the Houston Rockets safely run away in Jurassic Park. This being the second loss of a back-to-back including travel returning from Chicago. With such a tough schedule, we can forgive them for running out of gas in Q4 -- yet this loss puts the Raps in a precarious spot. They're only one thin game ahead of Boston -- and they play the Celtics Tuesday. 1/10/17 -- If today is Tuesday, this must be Boston. Raps blew their First Quarter lead, heading for a third straight loss -- and third place. Oh, the discouraging misery! But with five minutes left, they found new energy. JV and DD made some incredible plays to pull away, Raps win this heart-stopper, 114 -- 106. Humbled Celtics staggered away from Jurassic Park. The Raptors needed this win, and finally they played like it. 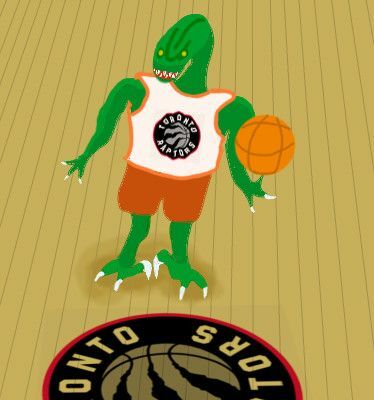 The current Toronto Raptors logo is not the only one -- a friend who's into B-ball showed me the vintage, dino-themed logo you see below. What if the logo could come to life? I've always joked that the Raps could use toe claws on their sneakers -- well, here they are! How would you like to guard this dude? As I'm writing this, the Raptors are playing the last-place Brooklyn Nets. It should be a cake walk, but actually it's a close, sea-saw nail-biter. Essentially, the Nets aim to shoot three-pointers from the next county, while the Raps play old-fashioned, in-your-face close-range ball. At the half they're up by one razor-thin point. 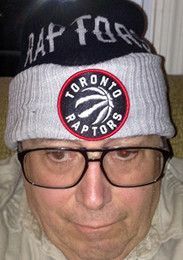 I sure hope the Raps win. (Edit: They did! With their classic 4th quarter push -- 132-113, outdoing my typical bowling score -- neither team being known for defense). So far this season, the Raps' schedule has featured above-average opponents; now they're over this hump to enjoy lesser competition -- and perhaps, a chance to catch up with Cleveland! 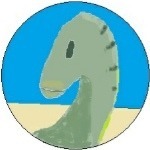 We Dinotopians do tend toward optimism. 1/15/17 -- It's as if Raptors president Masai Ujiri practices The Codes of Dinotopia. Others first, self last, & Give more, take less: He brought smiles to schoolchildren of La Loche, which has recently suffered a school shooting. Do one thing at a time: He's growing the team organically, turning down big trades. 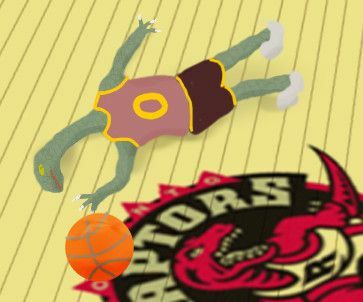 Today the Raps are busy devouring the New York Knicks, building a 38-point lead while their starters remained in play. In Q4 the Knicks tried to come back, dropping the lead to 13 -- but it was all for naught. The Knicks got spanked, leaving the Raps on a three-game win streak. Let's make the streak 10 games, for a Last-10 of 10-0! 1/18/17 -- Last night Jurassic Park broke out in Brooklyn as the Raps bested the Nets. Now in Philly they're in a tough situation -- down by a few to the 76ers with four minutes to go. Another back-to-back road game, this is -- the NBA should re-evaluate their schedules! Toronto's apparent weariness facing consecutive games doesn't bode well for a future playoff run. Raps lose, 94-89 -- their score being 24 points below their average, the 76ers had held them for ransom. In the midst of all this shame and reproach there's one piece of good news: Jared Sullinger made his first appearance this season after suffering a broken foot early on. Last Friday, Raps fell to the Hornets for their second loss in a row. Not good. Tough times like this expose the bandwagoners, an attitude I'm trying hard to avoid. I just say, "Win or lose, they're still my Raptors!" Yet, evidently they have plenty of work to do. Today they play the Phoenix Suns, who had won in their last encounter. At the half the Raps are enjoying a three-point lead, we can only hope it holds up. As usual, the operative word is, defense. Edit: They just lost this one too -- despite carrying a lead into Q4. Oh, well. Win or lose, they're still my Raps. Come on, guys, sharpen your claws! 1/24/17 -- It's hard to feel good about this next one. At 7 PM EST the Raps host the San Antonio Spurs, #1 in the Southwest with a 35-9 record. And with DeMar DeRozan sidelined by a sprained ankle. I fear this will end with only more shame and demoralization for this already-hurting team. 9:25 PM and a thin minute to play, Raps down by 2, 106-104 -- much closer than I had feared. Can they pull out a victory? Nope. Four-game losing streak and counting. But at least this one wasn't a rout. 1/27/17 -- After losing five in a row, tonight the Raptors host the Milwaukee Bucks. At the half they lead by 14 points. Perhaps their awful losing streak ends here, but I'm not staying up to find out. Edit: They won! 2/ 5/17 -- This past week has seen the Raps in utter freefall, losing 8 of their last 10 (and all of their last five on the road). It seems like nothing works, there is disarray, discouragement, demoralization, and frustration all around. It's as if the meteor hit last December 28, and no one can right this listing ship. Today they play the last-place Brooklyn Nets -- if they lose this one, well, time to pack up and quit. It turns out the Raps did best the Nets, yet not blowing them out as they might have two months ago. Once on pace for a 60-win season, now they're in third or fourth place (it doesn't really matter which, does it?). We well know that Raptors president Masai Ujiri and company prefer to grow their team organically, rather than go for deals. Yet, with things going as they are, and the NBA trade deadline looming -- might it be time to trade for a big man in the front court? Over at Raptors Republic there's a podcast discussing this trade issue, as well as the Raps' malaise generally. Tonight they're playing the LA Clippers, a nearly perfect match as far as the standings go. My heart is trembling in fear over this one. The Raps are back! They just pulled out their second W in a row, and this one against a worthy opponent. With both their All-Stars finally on the floor, they're perking once more! 2/12/2017 -- Toronto just blew a 16-point lead & lost to the Detroit Pistons. This is after losing three days ago to the Bucks. This stinks on ice! 2/23/2017 -- We got not one big man, but two! The Raps traded Terrence Ross, Jared Sullinger, and three draft picks for P.J. Tucker and Serge Ibaka. This potentially boosts their power at the basket -- where they need it -- tremendously. 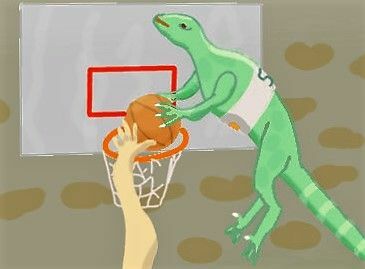 This Friday the Boston Celtics appear in Jurassic Park for what I hope will be a whupping! 2/26/17 -- Oh, this is another heart-stopping close game, Raptors basketball at its finest. It's been mostly five points or less the whole game, with the Raps leading by one at the half. This moment as Toronto takes a time out, they're leading 72-67. One sour note: Kyle Lowry is out for weeks with a wrist injury -- yet these Raptors are playing with heart we haven't seen in months. And did I mention -- last Friday evening, the Raps whupped the Celtics. If they win this one they'll have three W's in a row. Right now it's tied at 80 all -- they're turning in a highly exciting and entertaining contest like the Raps of last November. And yes, they won this one. Tomorrow they face the NY Knicks. 2/27/17 -- Raps win 4 in a row! They have managed to reverse their January script -- now it's their victims' turn to blow leads while Toronto comes from behind. The Knicks were ahead by 17, only to see the Raps win by one. 3/3/17 -- Just two days ago, the Raps couldn't do anything right as the Washington Wizards had their way with them. Now they face the Wizards again tonight -- this time in Washington. A frightful prospect, yet the Raps found new energy to pull out this much-needed win! And I'm doing my roar-and-claw dance. 3/4/17 -- Second game in a road back-to-back after yesterday's monumental win. This time in Milwaukee, the USA's beer capital . The Bucks were up by 10 just moments ago, now the Raps have closed it to four with five minutes to play. Can they reel this one in? Nope. I need a few brews myself after this one. 3/8/2017 -- With three in the books, Toronto leads by 4 over the New Orleans Pelicans. Yes, they won it! 3/17/2017 -- After yesterday's demoralizing loss in Oklahoma, the Raps ran away with a win in Detroit. The claws were out tonight! 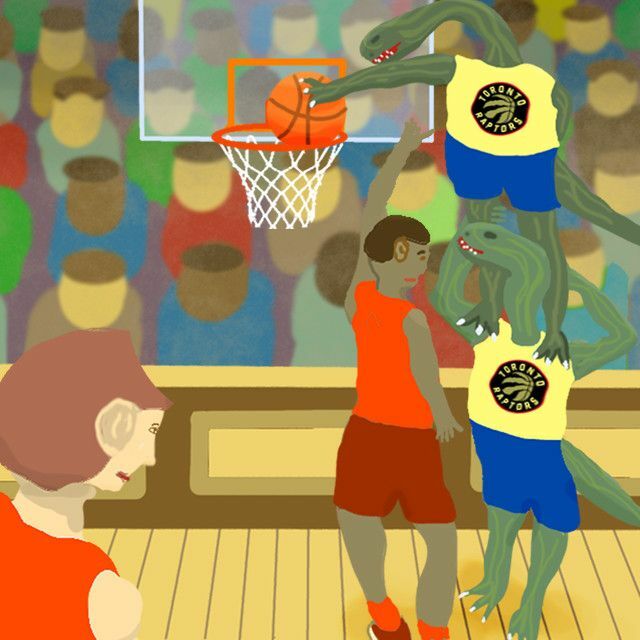 Raps 116, Pacers 91 in "Jurassic Park." This one was never in doubt. Coach Casey of course is quite happy; everything just clicked. We all could wish for some more consistency from this Raptors team, but aah, the glory is glowing right now. 3/22/17 -- Last night the Raps were losing by 15 points to the Chicago Bulls late in the 3rd quarter. So then I got discouraged & shut it off. Me of little faith! They came back to win this one in overtime, 122-120. 3/23/17 -- Another roaring Raptor win! Over Miami, 101-84, their fourth W in a row. DeRozan scored 40 in an incredible effort. The Raptors and Bucks go into tonight's game tied in the series, a game apiece. So what's happening in Milwaukee tonight? With three quarters in the books, the Raps trail the Bucks by an incredibly awful, downright humiliating and positively embarrassing 78-46. No roar-and-claw dance for me -- only grief and misery. The radio announcers are lost for words to relate this miserable "performance." Up next -- the Raps face Game 4 in Milwaukee this Saturday, down 2-1 for the series. The Raps are known for playing their best with their backs against the wall (like cornered raptors?). Yet, I'm getting tired of all the drama. 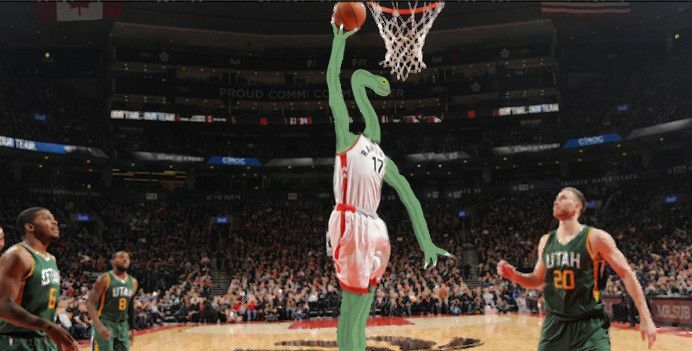 They really need a W with this next game -- nothing less will save the 2017 Raptors from an early extinction. And the Rap's issues don't end with their run this season. Several of their key players become free agents soon -- if Raptors management want to keep this bunch together, it would put them deep into luxury tax territory. And they way the Raps are playing right now, no one would be surprised if they didn't. They do have one ace -- their top-notch development-league team, the Raptors 905. Perhaps some of this outstanding talent is ready for harvesting. 4/22 -- Game Four: After three quarters, the Raps are up by six. But it may not last for long, with the Bucks hustling. A win would bring the Raps back to Toronto, even in the series and with home-court advantage. If they blow this one they'll have to win three in a row, two of them in Milwaukee. Not likely to happen, so they really need this one! Well they dodged the bullet as the Raps win the game, 87-76. With the series even at 2 games apiece, we could very well go seven games. Game Five is at home on Monday. 4/27 -- Last Monday, the Raps won Game Five at home. Tonight after blowing a 25 point lead they hang on to close out the Bucks, 92-89. Raps in six! Props to both teams for a truly heart-stopping game. The announcer says, "And now we can breathe." Breathe deep, that is. Next, the Raps move on to Round Two, in Cl ... Clev ... my fingers are faltering ... (gasp) ... Cleveland. My brachiosaur soul is shaking over this next series. If it appears like Cleveland was playing to make highlight moments, they were. They could do anything they wanted. Did the Raps even show up for this game? Most emphatically yes! It just wasn't enough. The Raps must win one game on the road to win the series. They get another shot Wednesday evening. Ya know, in some parts of the internet for those who grew up in the 90s, it's kind of a crime to talk about the Toronto Raptors and not bring up a certain Gatorade commercial made back in the year 2000. Awesome! I have never seen this before. Quite remarkable cgi for a commercial -- and lots of fun. I guess raptors prefer berry flavor. What a gymnastic slam dunk at the end! Thank you for posting this. Well, here we are, exactly where I began this thread last year. Toronto arrives back home after dropping the first two in another epic struggle with Cleveland. And just as with last year, the Raptors are finally playing ... well, like raptors. Well into Q2, Raps trail by just one. The crowd's chanting, We The North. DeRozan just scored a field goal plus a foul shot, Raps now lead by two. With two in the books, Raps lead 52 -- 49. We're halfway home! Can they hold on? Sorry to say, no. In the second half, the Raps can't sink a basket to save their lives. Literally. This one is already over with six minutes to go.